Warm and soft this adorable Puppy Angel Luxury Coat is an is perfect for chilly days. 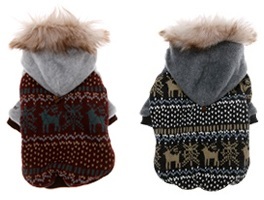 If you change your mind you can change their outfit with this cozy Two-way Eskimo Jumper from Puppy Angel. Made from quilted warm fabric decorated in little reindeer on one side, the other side is soft polar fleece. Each coat has a faux fur trimmed hood. Available in S SM M L XL.